For wings: Season well with salt, pepper, and chili powder. Either grill or deep fry them. You want crispy skin. Grill them over direct heat till skin is crispy, and if they aren’t done, cook a little longer over indirect heat. For dipping sauce: Blend peaches in a blender or food processor first. Add the rest of the ingredients, and simmer in sauce pan until reduced to about half. 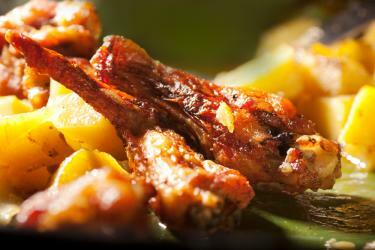 Toss crispy wings in sauce and serve hot.